Whenever I roast chicken marylands for the kids, my husband asks if I can make duck marylands for him instead. So I went on a search to find a new recipe on how to bake duck marylands which gives you a super crispy skin, but the meat is delicious to. 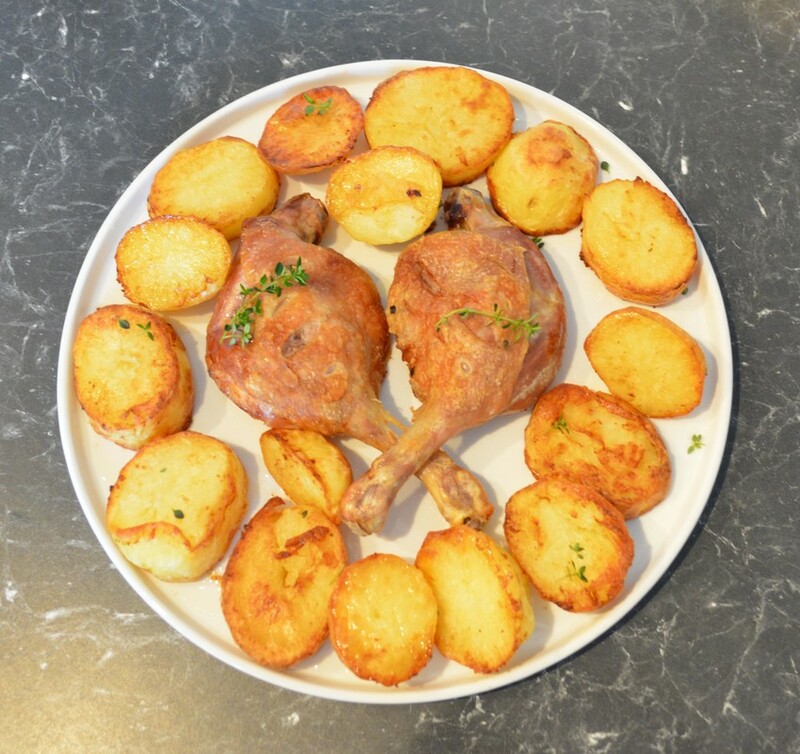 This recipe bakes the duck and potatoes in the same time frame, and produces super crispy skin on the duck, the meat is not dry and the potatoes have a great crunch to them. It was delicious. So simple, just put it in the oven, turn the potatoes over after 30 minutes (in the duck fat that the marylands release), it bakes in an hour, dinner is done, so simple, so tasty. I've made this a dish that serves 2, but double the recipe if needed. If you make more and you need two baking trays, as you don't want to over crowd the baking tray, just remember to switch the trays halfway through cooking. ​I generally use desiree potatoes, but use any baking potato. These are the best baked potatoes you will ever have. Crispy on the outside, soft on the inside. Serve it with a simple green salad and you have a complete meal with very little effort. Recipe is adapted from Nigella Lawson's Cookbook 'Kitchen' Recipes from the Heart of the Home. On the stove top heat a roasting tin (or frying pan) and sear the duck marylands, skin side down over a medium heat until the skin becomes golden and the duck starts to release some of its fat. Turn the duck over and turn off the heat while you prepare the potatoes. Peel the potatoes, then cut them into 2cm slices across. If you seared the duck in a roasting tin, arrange the potatoes around the duck. If you used a frying pan that can't go into the oven, transfer the duck and the fat it released into a roasting dish, scatter the potatoes around the duck, at this stage you only need enough duck fat so that the potatoes don't stick to the dish. Don't add too much extra oil as the duck marylands will release a lot of fat whilst baking. Scatter thyme over the duck and potatoes. Season with salt and pepper. Place in your preheated oven. Bake for 30 minutes, now turn the potatoes over, so you get super crispy potatoes. 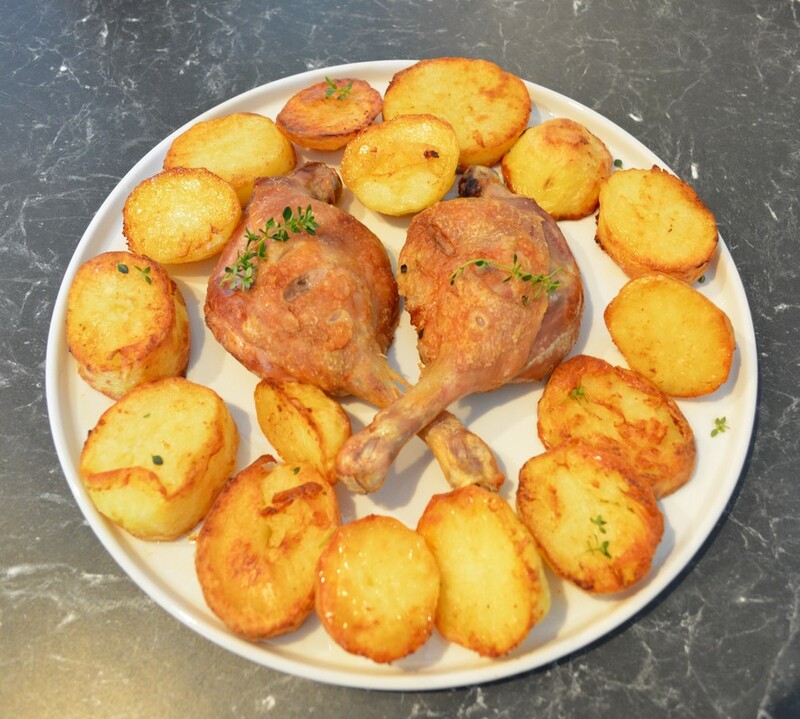 Once the potatoes are turned, place back into the oven for a further 30 minutes or until the duck is cooked and the potatoes are golden and crispy.